On Sunday Oct. 28, the LVSD Pop Warner Triton Football team competed against and beat the Diamond Bar Huskies 8-6 to win the Mt. Badly Pop Warner Championships, completing an undefeated season. Now the Tritons move on to regional play in Orange County. The Triton team, led by Coach Bob Moore, comprises 9-, 10-, and 11-year-old players. They are a fantastic young team that has scored a total of 210 points this season, yielding only 38. Their motto is “Hard Work,” and it shows. On Saturday Oct. 20, 2012, the Triton Jr. Pee Wee Cheerleaders competed and took first place in the Mt. Badly Cheer competition, racking up the highest score in the competition. They will now represent the Mt. Baldy Pop Warner conference on Nov. 8, at the Long Beach Arena competing for a chance to go to Walt Disney World Florida. These talented young ladies, who cheer at every Triton football game, undergo weekly gymnastics training and practice, and compete locally, regionally, and, we hope, nationally this year in Florida. LA VERNE/SAN DIMAS POP WARNER YOUTH FOOTBALL AND CHEERLEADING has been providing youth football, and cheerleading in La Verne and San Dimas since 1963. In 2013, the league will celebrate its 50th year serving our community. 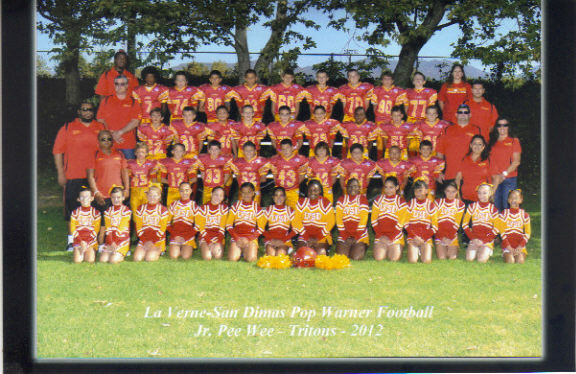 La Verne San Dimas Pop Warner provides the best possible experience for all their participants while stressing the values of TEAMWORK, SPORTSMANSHIP, and SCHOLASTIC ACHIEVEMENT. This season, LVSD introduced a brand new division to its athletic menu by establishing a Challenger Football and Cheer program. This program allows handicapped youth to play football and cheer. This season the team fielded six football players and four cheerleaders, numbers the league hopes to double in 2013. LVSD would like to congratulate its Triton Football and Cheerleaders for their Championship wins. We are very proud of our Triton team, and all of our LVSD teams for their outstanding 2012 season.